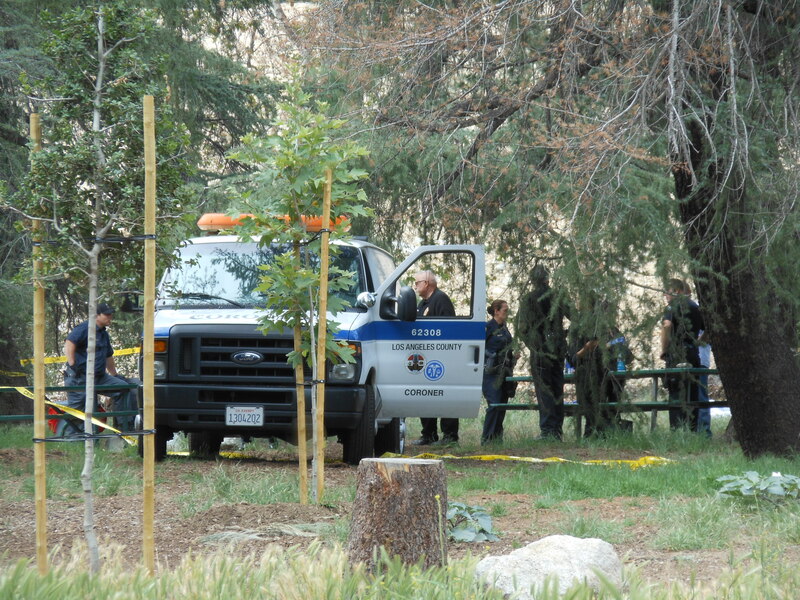 SIERRA MADRE >> A man was believed to have fatally shot himself at a Sierra Madre park filled with families on Sunday afternoon, authorities said. Police received numerous calls just after 12:30 p.m. reporting gunfire at Bailey Canyon Park, 451 W. Carter Avenue, Sierra Madre Police Chief Larry Giannone said. “Officers arrived on scene and found a male down on the ground,” the chief said. A doctor who happened to be nearby heard screaming and rushed to help, Giannone said. The doctor was performing CPR when first responders arrived, however paramedics pronounced the man dead at the scene. The identity of the man had not been determined Sunday afternoon, Los Angeles County Department of Coroner Lt. Fred Corral said. Police described him as appearing to be in his 50s. A gun was recovered near the body, Giannone said. The investigation was ongoing, he said, however initial indicators pointed toward suicide. The shooting took place near picnic tables and a hiking trail as more than a dozen people, including young children, were recreating in the park, Giannone said. In addition to the loss of life involved in the incident, “This was an unfortunate tragedy for our community,” Giannone said. “The park was filled with visitors and hikers, several who witnessed this tragic incident”. Officials continued scouring the scene for clues and interviewing witnesses. Coroner’s investigators were also summoned to the scene. Police also examined a black Toyota RAV4 SUV in the parking lot that the unidentified man was believed to have arrived at the park in. It was not clear Sunday afternoon whether the screams reported by the doctor came from the man who ultimately died, or others who witnessed the incident or its aftermath. This entry was posted in Sierra Madre, suicide by Brian Day. Bookmark the permalink.